I can't speak for Navy squadrons, but I know the Marine squadrons had enough to do to keep up the Flight Schedule, not to mention the test and rework schedule. Didn't leave a whole lot of time to visit the wash rack. About the only time a bird got a good bath was when it was coming out of an Annual. The rest of the time, it was up to how well the Plane Captain assigned to that bird wanted to wipe his plane down between refueling, daily inspections, turn arounds, etc etc. Another factor that entered into it, in Yuma, anyway, was that come the afternoons, especially in summer, touching the upper side of a plane could lead to 2nd degree burns. And the dust in Yuma got everywhere. It stuck like glue too. Turn around, and the dust has settled everywhere. Very difficult to keep a plane clean in Yuma. Just my 2 cents worth. To me, a clean plane is suspect. Is it new? Just come from Depot, or what?? 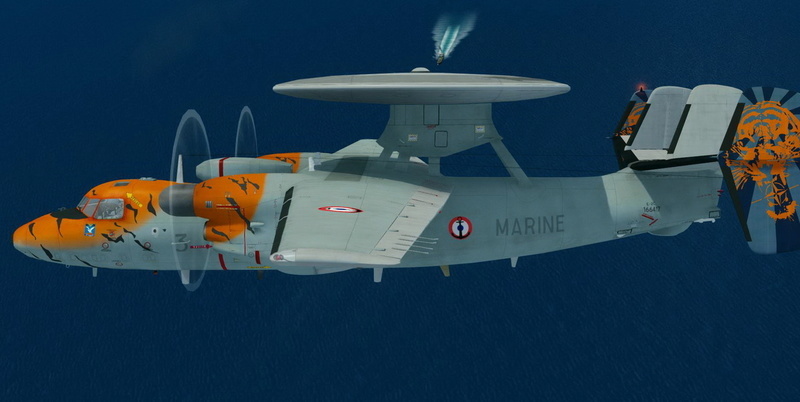 I had done VAW-126's paint job in 2014 before but I wanted this to be an up to date repaint so instead I did this one from current photos of Seahawk 603. The photos were posed on the FSX Acceleration Carrier using the Carrier Tutorial and switching the aircraft to the Hawkeye. I really like the paintkit and had just a couple of hiccups which I figured out with no problems. 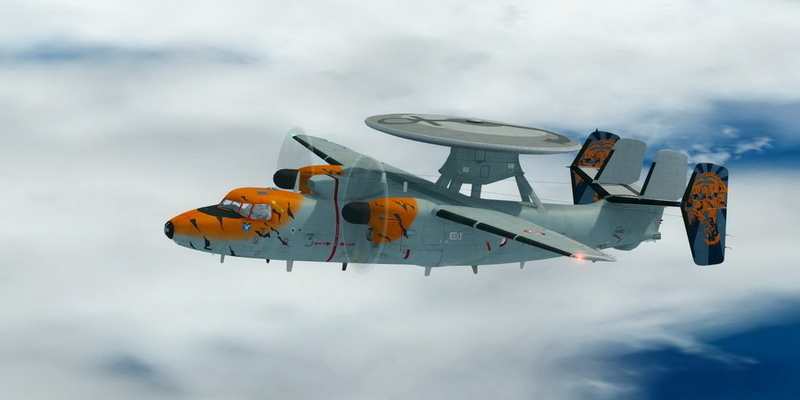 VAW-126 as you can see does not put the aircraft number on the aileron but on the upper wing. gents - your paints looks awesome - great jobs ! Great repaints. Are they available for downloading somewhere?? 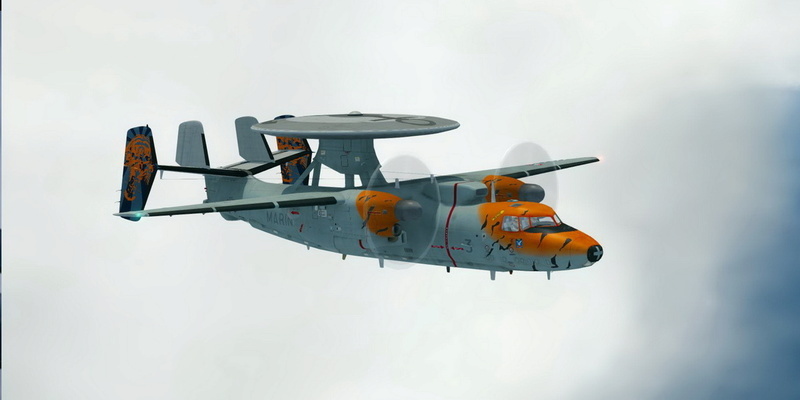 I've got the NATO Flotille 4F from Avsim, but not the others. Thanks. 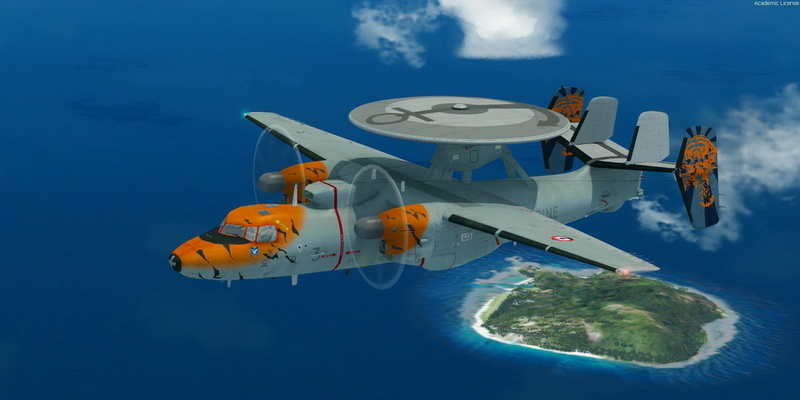 I will be sharing the C2 Greyhound from VRC 40 2014 and the E2D hawkeye from VAW126 2018 this week sometime here in the SOH. I will post here in this thread again when I upload them. 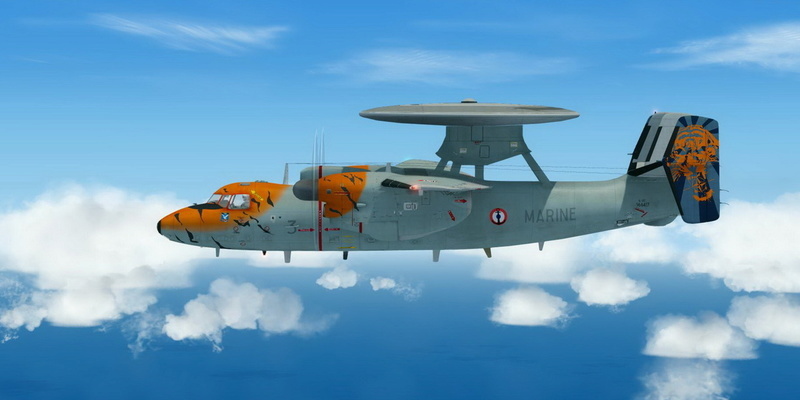 My MFG 3- and M.M.I-Repaints should be available at avsim.com soon - just finished the upload-procedere. You're welcome Pam. Both of my repaints have been uploaded to the Warbirds Library in the FSX Post Coldwar Repaints Section. I found a "boo-boo" on the VRC40 that I noticed when I opened up the thumbnail for the Library photo that it had no Modex on the nose so that was corrected in the upload. Pam?? I don't think Warchild and I look anywhere near related. Shirley, you must be joking. Just downloaded the VRC40 2014 OEF and I'm not getting any unit patch forward of the crew door or ship name and/or lettering tribute to Rear Adm Sara A. "CLUTCH" Joyner on the aft side fuselage. Neither Port or Starboard side. All other textures look great. Any suggestions? Boy, I thought I'd get out of the year without any mistakes (LOL???????) EGG ON FACE!!! Sorrrrrry. I saw War*** and got it wrong. Enjoy the repaints. Hope that Warchild aka Pam will enjoy them too. Don't apologize, I dig your paints! I don't know. First, what sim are you using? I will check on it. I saw where I was missing the Modex on the nose and redid the PSD. I will check it out again and put in a patch here if somehow they got lost. Give me a few minutes to check it out. Well, its having more than one file (which BTW is now gone) with names too much alike from when creating. Its a good way to do it I learned from one of the experts so that you don't mess up the last good one but when I went back to add the Modex on the nose and nosewheel door, well...you know what happened. 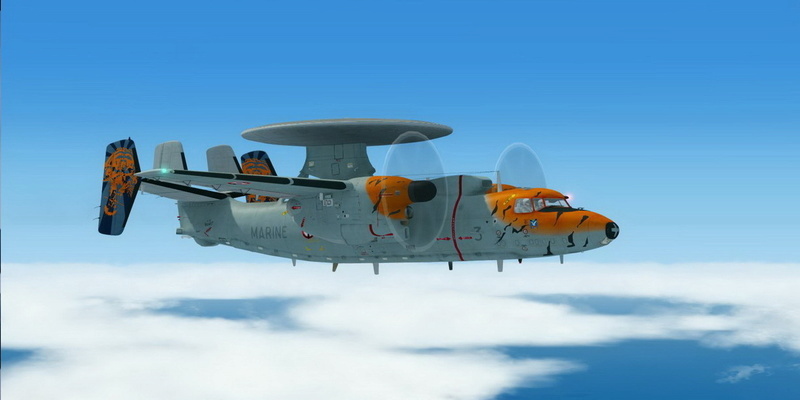 I checked it out on the ground at NAS Pensacola in my FSX and all is well. Anyway, here is a Dropbox link to a zip folder with the correct C2greyhoundfuselagecolor file. Just replace in the texture folder. Gave me a definite chuckle.. Thanks again for the textures and patch. Thanks Richard, the texture patch works great. Great looking Greyhound. I did this repaint for the Abacus Flightdeck 5 E2C Hawkeye back in 2014 when I was squadron CO of the squadron in vCVW3 aboard USS Truman with Wood and the other guys. I had a lot of fun doing this and I actually did ALL 4 aircraft paints. It took 2 days to get this figured out how to fit it on Dino's E2 Paint Kit but I think I managed. Here are three shots I took this afternoon after I completed Seahawk 600. All markings are authentic including the registration and the pilot and copilot. I hope you enjoy it. On the runway at Pensacola taking off to return to the Truman. Lovin' the anchor on the rotodome! FYI, just got the email from Simmarket about an update for 1.0.2.